description : multifunctional table/ console. Its rounded esthetic shape is perforated with 10 holes that make a beautiful pattern and also are functional: they can contain 10 wine/ liquor-bottles or other stuff like magazines. 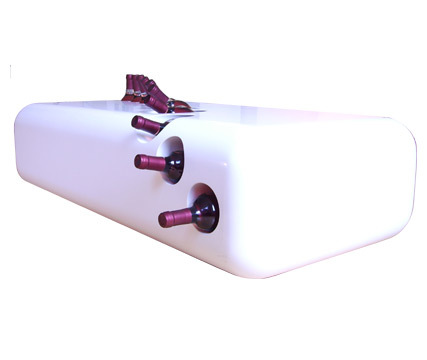 When put on its side or standing up:"Shots" becomes a liquor-console that can be put against the wall and can be used for bottle-storage and to fix drinks on. The placing of the holes will keep the bottles in place when putting it on its side. Winner "best interior product" Horecava innovation award 2008.